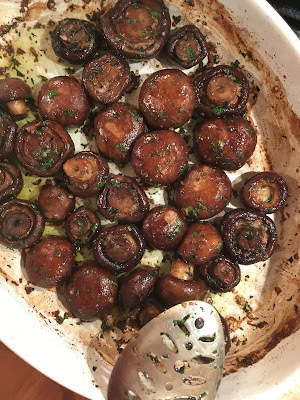 I’ve been looking for any excuse to turn on my oven the last couple of weeks, and these mushrooms will heat up your kitchen and make any meal a bit more memorable. Preheat your oven to 450 and brush the dirt from approximately two dozen mushrooms. I recommend using at least two dozen as you’ll eat more than you think, and they’ll last for days in the fridge. In a large bowl toss the mushrooms with some salt and pepper and just enough olive oil to coat lightly. Slide them into a roasting pan, then into the oven for 30 minutes. At this point anything goes, smoked paprika, garlic and parsley, thyme, rosemary, chili flakes, fresh lemon juice, balsamic vinegar, butter, whatever works best with whatever else you’re cooking. Toss and return to the oven for another 15 minutes then salt and pepper to taste.